Instant Pot Beef Stew – a rich, healthy, and wonderfully tender pressure cooker beef stew that tastes like you’ve been cooking it all day long, but it’s made in your pressure cooker in a fraction of the time it normally takes! 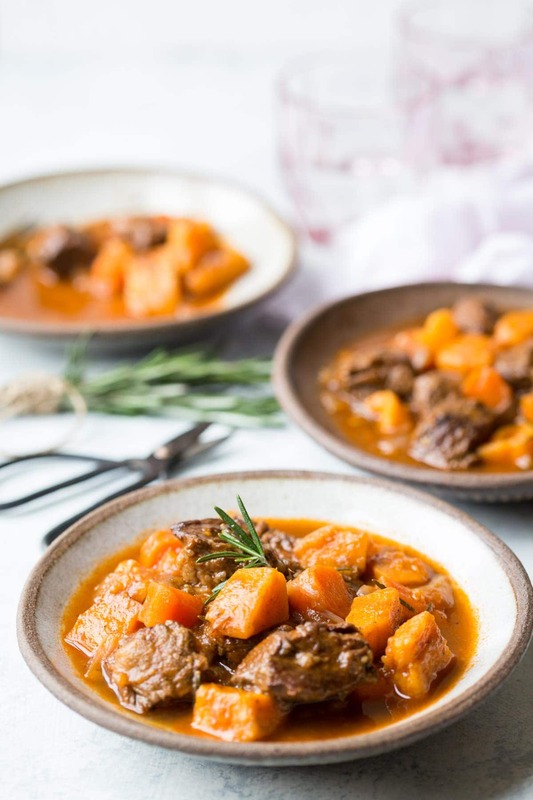 With added recipe tips and step by step directions, this is my families favorite Instant Pot beef stew and it’s very simple to make with everyday healthy ingredients you can find in any grocery store, and of course it’s gluten free, paleo and Whole30. Choose the right cut of meat for making beef stew. I go into this in more detail in the paragraph below but I always recommend beef chuck to make the best Pressure cooker beef stew. Brown the meat to get the wonderful Maillard reaction, this will help create a wonderful flavor for your finished stew, and make sure to do it in batches so it actually browns properly and doesn’t end up being steamed instead. Please ensure you properly deglaze the bottom of your electric pressure cooker, not only will it add to the finished flavor of your stew, it will prevent the dreaded ‘burn’ notice that can appear. If you want to double the recipe the cook time will remain the same, however you need to make sure that you don’t go over the maximum fill line on the inside of your pressure cooker pot. Cut the vegetables according to the directions in the recipe, if you cut them really small they may be overcooked when you open the lid. Have the vegetables prepped and ready to add to your pressure cooker at the end of the first cooking cycle, otherwise you will lose the heat in the stew if you open the lid and are not immediately ready to add the vegetables to the pot. 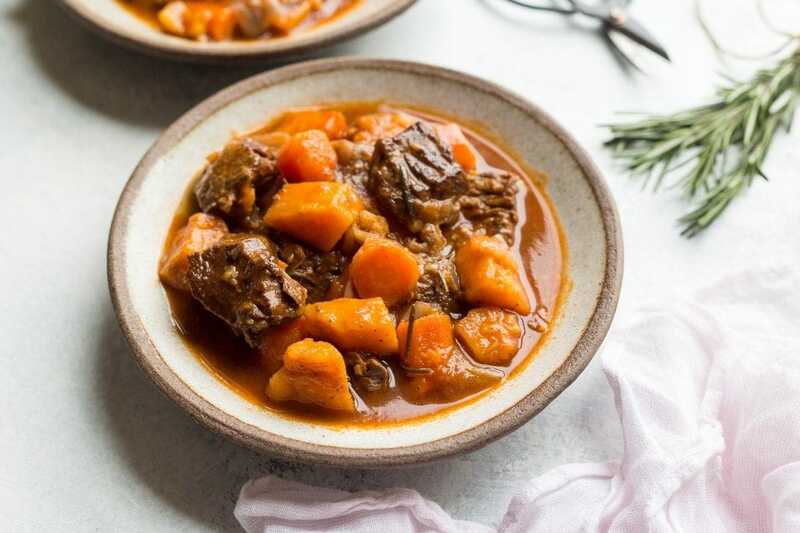 How long should I cook Instant Pot Beef Stew for? I like to cook my Instant Pot Beef Stew for 12 minutes at pressure and then let it sit until all the pressure has released naturally, this will take an additional 15-20 minutes usually, then I add the vegetables and cook for a few minutes more. What is the best cut of meat for Instant Pot Beef Stew? My favorite cut of meat for making really tender Instant Pot Beef stew that cooks reliably well has to be beef chuck. 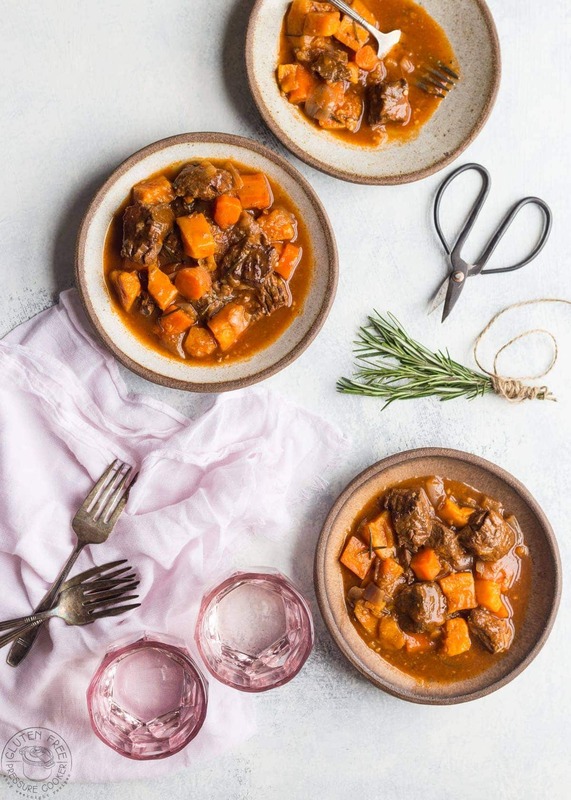 It’s a relatively inexpensive cut of beef with plenty of fat and connective tissue which makes for a good, flavorful stew so it’s always my first choice. If you don’t have chuck roast then pick a cut that you know has plenty fat and connective tissue and is suitable for long slow cooking, this will work much better than beef that you would cook quickly and is very lean, they simply don’t work as well for pressure cooking and usually end up dry and stringy. 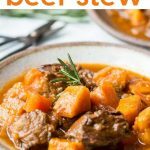 How do you thicken up Instant Pot Beef Stew? While you can sometimes use the traditional method of dusting the beef chunks in flour or starch before you brown it, you run the risk of having the dreaded ‘burn’ notice appear on your instant pot, so I find it’s simpler to thicken the stew after you’ve opened the pressure cooker. I simply mix up my starch of choice with a little cold water, cornstarch works well, or arrowroot or tapioca starch if you are Paleo or Whole30, then simply add it to the hot stew and stir really well until it thickens up. You may need to turn on the saute function and simmer it for just a few minutes if you find it doesn’t thicken right away. Is Beef Stew Good for you? Yes! If you choose beef that’s preferably grass fed rather than grain fed then you’ll reap the benefits of having beef with a higher Omega 3 content than grain fed beef. But even non grass fed beef is a great source of vitamin B12, it’s high in protein, and also contains niacin, vitamin B6, selenium, zinc, iron, and phosphorus. And don’t forget the fresh vegetables and herbs! We have sweet potatoes, carrots, garlic and rosemary in our stew recipe which together packs a real nutritional punch including dietary fiber, lots of vitamin A in the carrots and sweet potatoes, and many antioxidant and antibacterial properties in fresh rosemary. Instant Pot Beef Stew - a wonderfully tender and flavorful pressure cooker beef stew that is packed with healthy vegetables and fresh herbs. Watch the recipe video, you'll find it below the directions. Cut the beef chuck roast into two inch sized pieces. Peel and chop the red onion, sweet potatoes and carrots as directed in the ingredients list. Brown the beef using the saute setting in your Instant Pot, add a little olive oil and do it in batches so you don't steam the meat, then remove and set aside, or you can do it in a large skillet if you prefer. Add the gluten free beef broth to the pressure cooker and be sure to fully deglaze the bottom of the pot to prevent the 'burn' notice from coming on, then add the beef chuck, salt, pepper, garlic, and tuck in two sprigs of rosemary. Lock the lid, turn the steam vent to 'sealing' and using the 'manual' or 'pressure cook' button, adjust it to cook for 12 minutes at high pressure, then let it do a natural pressure release for 15-20 minutes. Release any remaining pressure, open the lid and quickly add the vegetables, tomato sauce, and tomato paste, stir, and immediately replace the lid and cook for 4 minutes at high pressure then quick release the pressure. If you find that any of your vegetables are still a little hard after that, simply simmer your instant pot beef stew for a few more minutes. How long they take to cook will depend on the size you cut them. If you want to thicken your stew further, use 2 tbsp cornstarch or tapioca starch mixed with a little cold water. Add a small amount at a time (you probably won't need it all) into the stew after you have cooked the vegetables, stir and then simmer until you get it to your desired thickness. This is approximate and may vary but allowing an average of 10 minutes for the stew to come to pressure the first time it should take about 40- 50 minutes total cook time including the time needed for natural pressure release. WHAT SIZE SHOULD I CUT THE VEGETABLES? So just like on the stovetop, the smaller the vegetable pieces the faster they will cook. I have given the sizes for the meat and vegetables in the recipe, generally speaking about 2 inch sized cubes will work with this recipe. If you do not have your vegetables prepped and ready to add to the stew when the pressure drops after the first cooking cycle and you have the lid off for more than a minute then you will lose the residual heat that is in there and it will take longer for it to return to pressure the second time. So the moral of the story is, simply have your vegetables ready to go and add them in as soon as you remove the lid, then get the lid back on quickly to retain the heat. This dish was absolutely amazing…great taste and texture. I found no need to add cornstarch. I highly recommend it!! I can’t wait to have a taste to this beef stew! Thank you for sharing this recipe! Could you use dried Rosemary? You could in a pinch, but fresh rosemary has a much better flavor for this recipe. 100% the best Instapot stew we’ve tried so far, the flavor of the rosemary is amazing and we have made this a regular part of our menu, even the kids love it! Thanks for the great recipe! I love beef stew! it looks yummy, I will definitely try this! Thanks for sharing!